Humanoids, 2015. Hard Cover. New. Jodorowsky, Ladrönn. Coffee table limited edition of only 750 numbered copies worldwide. This is the 'Coffee Table Edition'. Lowly class R' detective John Difool and his faithful companion, Deepo, are unwillingly hurled into yet another universe-saving mission, as their world is faced with the threat of an all-devouring metallic virus. 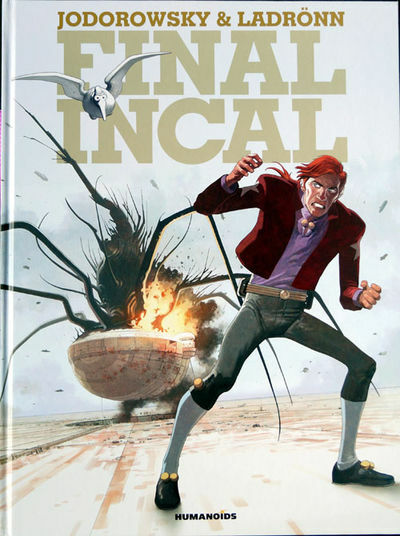 Visionary storyteller Jodorowsky returns to the epic mythology he created with the late Moebius in the early 80s. For the conclusion of the legendary spiritual space adventure series, he partners with Eisner-winning artist Ladrönn ("Cable," "Hip Flask," "Elephantmen"). Each copy in this extra-large format coffee-table edition is from the numbered limited edition of just 750 worldwide. 156 pages. Full Colour illustrations. 12" x 16" (310mm x 410mm).